A solid majority of Americans now agree that government intervention is needed to limit the catastrophic impact of climate change. While legislative action at the national level is still stalled, Californians and their elected leaders have moved forward, embracing the need for strong climate policy since the early 2000s. As the state is the world’s eighth-largest economy and 14th-largest emitter of greenhouse gas (GHG) emissions, the California legislature has committed to the most aggressive state benchmark in North America: to lower GHG emissions to 80 percent below 1990 levels by 2050. The Golden State has emerged as a model for GHG reduction policies, both nationally and worldwide. California’s strategy has been one of “mix and match,” combining traditional command-control regulation, market-based incentives, and strategic public and utility ratepayer investment. In 2002, the state set the first rigorous Renewable Portfolio Standard (RPS) for the electricity sector, and in 2006, it passed the Global Warming Solutions Act (Assembly Bill 32) to set GHG reduction targets for 2020, which the state is on track to meet. In 2015, Senate Bill 350 passed, putting California on an even more ambitious path to generate half of its electricity from renewables and to double energy efficiency savings by 2030. This new law also requires utilities to accelerate the expansion of electric vehicle charging infrastructure to further reduce dependence on petroleum. And in 2016, California passed Senate Bill 32 (and its companion bill AB 197), which commits the state to the next phase of climate targets by requiring the state to reduce GHG emissions to 40 percent below 1990 levels by 2030. With these targets and a diverse set of climate policies, California is clearly on a path to transition to a low-carbon economy. While California has led in climate change mitigation, it is also an unfortunate leader in inequality. Huge wealth, income, and wage disparities mark the state’s social and economic landscape. Despite its booming high-tech economy, the Golden State now has the highest poverty rate in the nation. Between 1980 and 2010, the incomes of California families in the poorest 10th percentile dropped roughly 24 percent; over the same timespan, the incomes of the wealthiest 10th percentile grew 34 percent. Income inequality has risen even further after the Great Recession, despite a steadily declining unemployment rate. These trends in income and wealth disparities are even more pronounced by race. The growth of low-wage jobs for a large portion of California residents has been a key driver of inequality and declining well-being for the bottom third of the income distribution. In 2014, 33 percent of California workers held low-wage jobs (defined as jobs earning wages less than two-thirds of the median hourly wage for full-time workers). These approximately 4.8 million California workers held jobs paying less than $13.63 per hour, and their annual median earnings amounted to only $15,300. Among low-wage workers, only a quarter have additional benefits such as health insurance or pensions from their employer. And while California’s population has been majority people of color since 1999, ethnic and racial minorities are disproportionately low-wage workers: while black and Latino workers make up 44 percent of the workforce, they make up 62 percent of low-wage workers. The impact of inequality is not just economic. Like poor environmental conditions, low wages and other disparities “get under the skin.” A substantial body of research links low socioeconomic status to higher disease risks and shorter life expectancy. Often geography further exacerbates the social and health challenges resulting from low-wage work. For example, low-income communities and communities of color live, work, and play in physical locations that are more frequently beset by multiple environmental hazards and social stressors. Members of these communities carry an increased risk of adverse health impacts due to the cumulative effects of being exposed to disproportionately high levels of air and water pollution, substandard housing, crime, and other stressors. Given these alarming conditions and trends, many advocates and policymakers in California have sought to weave equity considerations into climate policy design. After all, climate change will likely make California’s disparities worse, in part due to what is sometimes labeled the “climate gap”: low-income communities and communities of color risk the greatest economic and health consequences from climatic shifts.16 Equally worrisome is the fact that climate policies can actually harm blue-collar workers, low-income families, and communities of color when decision-makers craft GHG reduction strategies without considering the all-important distribution of costs and benefits. For example, when subsidies only help wealthy consumers purchase solar panels and electric vehicles, then public or ratepayer resources are diverted from those who remain vulnerable to the problems of job loss, low-wage work, existing pollution hotspots, higher energy prices, “heat islands,” and other challenges. The key political advocates of constituencies concerned with both climate change and inequality in California are community-based organizations that commonly work under the banner of environmental justice to alleviate poverty and pollution, and labor organizations that raise concerns about the need for family-supporting, career-track jobs. Both groups have engaged in climate policy, have the ear of key legislative leaders, and have had significant policy victories. Although they sometimes find themselves in conflicting positions, both groups also have overlapping concerns that have garnered support from key elected officials. Partly as a result, state officials have enacted a number of crucial policies to address equity in climate mitigation, yet more progress is both needed and possible. the support elected officials need to steer the state’s transition to a more equitable low-carbon economy. 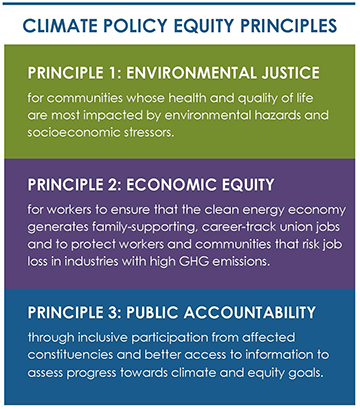 We propose the Climate Policy Equity Framework to help advocacy groups, state lawmakers, and regulators advance a common-ground equity agenda for California climate policy. In this framework, we group shared equity criteria under three broad principles (see sidebar). Together, these criteria can be used to develop and evaluate climate policy proposals. diverse constituencies requires shared values, a common agenda, and trust that develops over time. We hope that this document supports a lasting conversation to build a new social contract to support the state’s transition to a low-carbon economy and to support California’s leadership role in addressing the climate crisis. Finally, we should remember that doing nothing about climate change will lead to severe economic disruptions resulting from sea-level rise, drought, extreme weather events, and forest fires, which will generate an economic, environmental, and moral rationale for being aggressive on climate policy. But there is also a distributional imperative: we can tackle the challenges of inequality weighing on the state and the nation through climate policy, and if we don’t, the inequities in our overall economy are likely to be reproduced in the emerging clean energy sectors. The following review of California’s climate change policies highlights both the impressive work that has been done to leverage equity issues in climate policy as well as the areas in which further improvement may be possible. Section 1 discusses why equity is important and outlines the concerns and advocacy of environmental justice and labor groups in California. Section 2 presents the Climate Policy Equity Framework to guide policymakers in setting equity goals and tracking performance. We review evidence of the impact of climate policy so far on the three main goals of environmental justice, economic equity, and public accountability. Our analysis highlights important indicators and corresponding data sources to better track the impact of climate policy on equity. Section 3 applies the Climate Policy Equity Framework to two cases of statewide GHG reduction strategies, one in the area of energy efficiency and the other in renewable energy. Our goal is to demonstrate ways to advance shared equity and climate goals as part of the process of evaluating, designing, and implementing GHG reduction strategies, using the Equity Framework as a guide. public accountability for achieving equity goals in climate policy. Berkeley – Governor Jerry Brown’s signing last week of two landmark climate bills, SB 32 and AB 197, demonstrates the emergence of a powerful coalition of environmentalists, labor unions and grassroots “environmental justice” organizations that will be crucial to achieving the new emissions goals, as explained in a new report by the University of California, Berkeley and the University of Southern California. The report, “Advancing Equity in California Climate Policy: A New Social Contract for Low-Carbon Transition,” identifies ways to reduce greenhouse gas emissions while ensuring that the low-income and working class in California do not bear the brunt of the costs and are included in the benefits of the state’s transition to a low-carbon economy. “Labor and environmental justice are two sides of the same equity coin,” said Carol Zabin, Chair of the Donald Vial Center for Employment in the Green Economy and a co-author of the report. “We show how California’s ambitious emissions targets can be implemented in ways that benefit California’s workers and most disadvantaged communities who are hardest hit by climate change and related environmental degradation.” she said. • Expand low carbon programs, like community solar programs and energy efficiency in the public and institutional sectors, that create good jobs and prioritize low-income communities, rather than individual homeowners and the more affluent. • Promote labor standards, including skilled workforce and local hire provisions on renewable energy, energy efficiency, and other “green jobs” that are publicly funded—as is already occurring in utility-scale projects under California’s Renewables Portfolio Standard. • Monitor “pollution hotspots” in disadvantaged communities with strict evaluation and data collection that assesses the relationship of the cap and trade program and local emissions, followed by corrective action if excessive pollution is found. • Establish “Green Zones” in California’s most disadvantaged communities to focus investments in comprehensive emissions reduction and community resilience investments, via community planning that includes environmental justice and labor organizations. • Start planning now for protecting workers and communities who may later be affected by the decline of greenhouse gas emitting industries. While California is not expected to lose jobs in the short term, the risk of job loss may grow as the state nears the emissions reduction targets set for 2050, especially in oil and gas extraction and refining. • Develop an annual Climate Equity Report based on tracking equity outcomes to enable state officials to monitor whether equity goals have been reached, and identify areas where climate policy should be improved to advance equity.